Women made up 24 per cent of the to­tal number of candidates who con­tested the 2018 Fiji General Election, says Supervisor of Elections Mohammed Saneem. Fifty-six women initially contested and at the declaration of the official results on Sun­day, 10 women were confirmed to take up par­liamentary positions for the next four years. 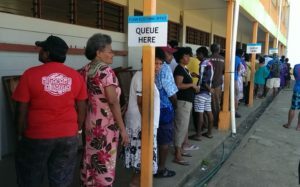 They are FijiFirst candidates Premila Ku­mar, Mereseini Vuniwaqa, Selai Adimai­toga, Rosy Akbar, Veena Bhatnagar; Social Democratic Liberal Party candidates Lynda Tabuya, Ro Teimumu Kepa, Adi Litia Qioni­baravi, Salote Radrodro; and National Feder­ation Party candidate Lenora Qereqeretabua. Mr Saneem said this year’s election had more women in Parliament compared with the 2014 election. “In 2014 the total number of women in par­liament was eight including the speaker and in the 2018 General Election we currently have 10 members of parliament who are fe­males, confirmed,” Mr Saneem said. He stated the 10 women raked in a total of 25,618 votes during election. “In 2014, 44 women contested the election – that was 18 per cent. The evolution of de­mocracy in Fiji is becoming more and more interesting,” he said.